Is Hamilton worth the hype? This is the question on every theater fan’s mind, as the popular Broadway tour sold out quickly after tickets were released. The short answer is yes. Hamilton is well worth the hype and wait. Hamilton truly is unlike any other Broadway musical I’ve ever seen. And I’ve had the great fortune to attend a magnanimous plethora of musicals. Everything about Hamilton is so fresh and unique- the choreography, the staging, the rhythm and book itself. Let’s start with the highlights. 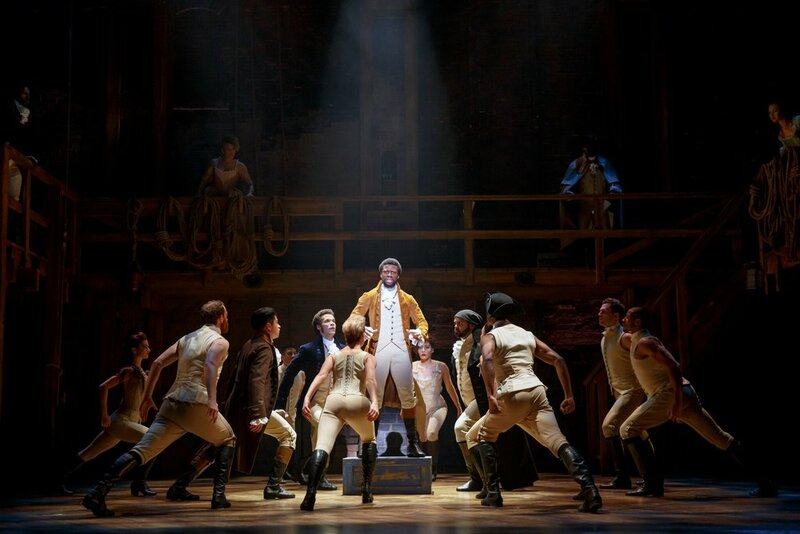 For those who don’t know, Hamilton is essential a hip-hop historical musical, which details the life and death of Alexander Hamilton (spoiler alert). The entirety of the dialogue is presented in both rap and spoken prose. For a good 20 minutes, I was actually unsure if the production would contain any actual Broadway-esque songs. To my pleasant surprise, the show does possess a few classically styled showtunes intermixed with the rapid fire dialogue. The amount of fast-paced dialogue is as impressive and swift, as it is rhythmical. The Gilmore Girls would surely be impressed by the voracity of the script. Hamilton is a smart show. A great deal of American history is packed into the two-and-a-half hour extravaganza. It's a stunningly nuanced look at both classic American history, as well as poignant commentary on the consequences of power, ego and hubris. One of the best aspects of Hamilton is the choreography. It’s a beautiful blend of hip-hop, Broadway, and contemporary styles of dance. The choreography really serves to highlight the frenetic paces of the show, as well as the seamless transition between big numbers. Joseph Morales and Nik Walker are both perfectly cast as Alexander Hamilton and Aaron Burr, respectively. To be honest, the show is stuffed full with expert Broadway veterans. Unshockingly, there is not a weak link among the group of talented performers. Thematically, Hamilton tackles the concepts of abuse of power. The most resonating song from the production is “My Shot”, which expresses the idea that we are given one shot in life to fulfill our destiny and we must make the most of the shot we are given, in order to avoid the destructive force of regret. It’s a theme that repeats frequently, and effectively, throughout the entire musical. Although I did not completely love every song in this production, the show itself felt full, purposeful, and complete. It’s a masterclass in theater production well worth the elevated prices.